Of course I yearn for the green of springtime. But since it is just January I had to settle for a spring-like winter vignette to bring me the essence of spring in winter. Oh, I can’t wait to see little bits of green on the tree branches. I love to watch the leaves open up. Right now it is as though the trees and the ground is holding back. Hinting at a promise for the changing of seasons, a few months away. I wait with the joy a child feels on Christmas morning for my plants to reward me for my patience. Such that it is. I dug around in my closet and brought out the tobacco-style flat basket. Then I added two green bottles I bought at HL a few years ago on clearance. Like a dollar or so type of clearance. The best kind! I love the way the light shines through the green bottles. And then I finished up with a few faux plants and the green and brown bead strand I bought for half price after Christmas. I think it was around $2.49. The green of the vignette brought me a small dose of spring. Sometimes the green of the earth is balm for the soul. I like to gaze at this vignette and think about the daffodils I planted. They should be the first to come up. I’m hoping the squirrels haven’t dug up all the bulbs I put in three containers. And of course I must show a few photos of the fur babies this morning. It is cold and we are all huddled in the living room savoring the heat from the black stove. 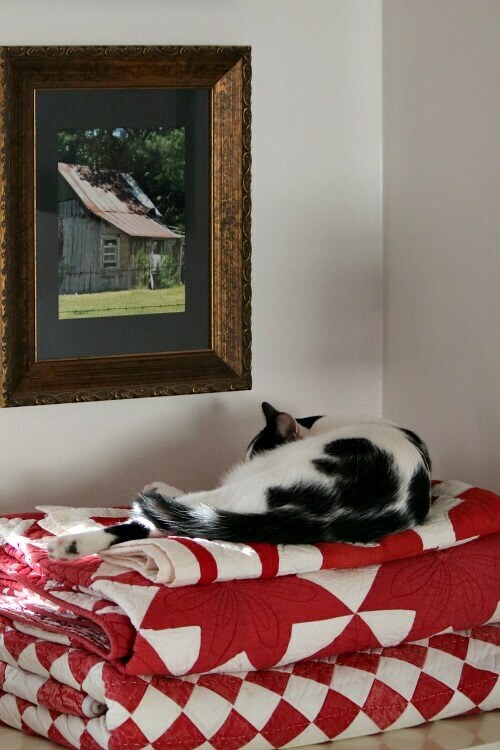 And Miss Queen of the quilt stacks is having her morning nap. When she wakes up, she’ll be clamoring for lunch. Love that vignette! The way the beads play off every other color, that soft sparkle of the glass… you hit that combo out of the park! I settled for a tiny pot of the mini daffs that the grocery store was selling; here in New England it will be several months before we see blooms in the garden. Those half off beads are coming in mighty handy! Really lovely Brenda! Very fresh looking. I always like a fresh look. the cutest picture of little Charlie Ross! he wins for most adorable little guy! I think so too! But then I’m his momma. Love that vignette! Hope Ivy leaves it alone. Have a good Sunday! So far she has. Fingers crossed. That’s what I was feeling when I created it. The photo of Charlie is the bomb! It looks like he’s smiling on the verge of laughing, LOL! I can’t think about spring yet, at least, no in house decorations. With the split into 3 of the dreaded Polar Vortex which dictates so much of our weather in SE Wisconsin, we got about 7 inches of snow overnight Friday to Saturday. Although Saturday had wind later in the day, the temperature was bearable. Today, brrrrr! In the deep freeze, even with the Sun out. Oh well. I was able to shovel well enough over about 2 1/2 hours, running inside every 20 minutes to thaw out for 30 minutes at a stretch. A helpful neighbor came over and snowblowed a pathway from the shoveled front sidewalk up my driveway to my back stoop, which I also shoveled out. Thank goodness for good neighbors. In lieu of planning for spring/summer around here, other than an intention to plot out enlarged garden beds and line with concrete paver blocks, I’m planning a couple of trips to visit relatives on their get-away cottage on land far up north Wisconsin. 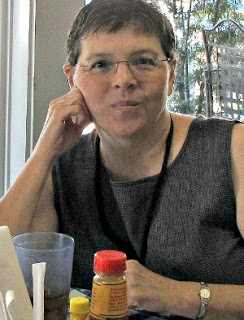 I haven’t done that for a few years now and I miss the small towns we visit and the lazy days inside the screen tent (the bugs always hover around me otherwise) reading, working/entertaining myself on my computer, and talking with my sister, nieces, nephews and extended relations, many of whom gather up there for Memorial Day and 4th of July. The wind is really blowing here. The kind of wind that whistles. I am believing this is why many quilters I know have lots of green quilts so they bring this season into their surroundings. 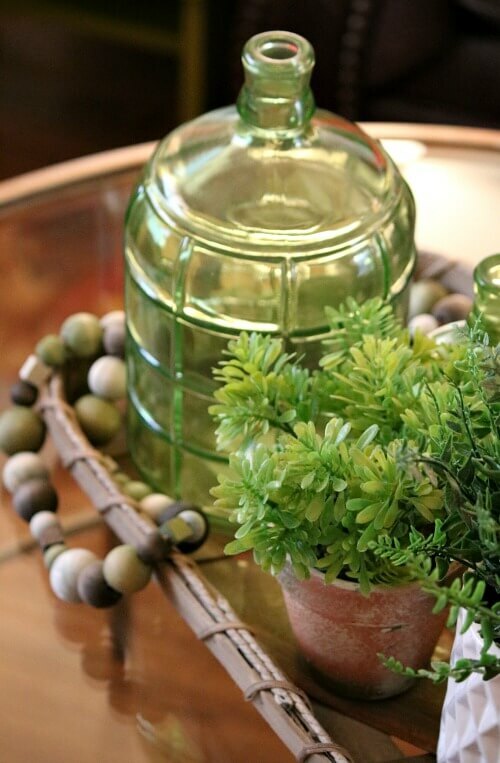 Shades of this soft Green is uplifting to decorate with this time of year. It gives us patience and time to dream as we wait out this season. Keep warm with your babies. Nice to have them tucked in next to you. I bet you’re right! We like anything green this time of year! Your spring vignette is lovely, and I love that quote on rain and sunshine. Here in MA it is raining sleet after having snowed all night and everything is turning to ice. Tomorrow expected temperature will be 0 degrees! See, Brenda, you could be worse off! We’re not that cold. And I don’t like sleet! Brenda, Charlie and Ivy good afternoon! I love the photo of Charlie, so funny! Love your vignette, a touch of spring on a winter day. Charlie sometimes has the oddest looks on his sweet face. I don’t know why, but I love the icy cold weather! The hot humid days will return too quickly for me, and then seem to last more than their share of time. I can sure deal with the cold better than the humid horrid heat. 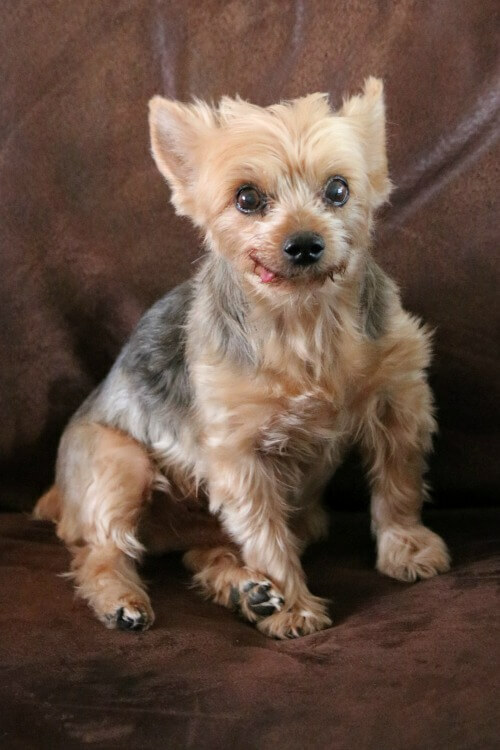 I laughed out loud when i saw Charlie, the most adorable little yorkie, so matter of fact with that tongue out. Ivy looks extremely comfy. Enjoy your day. We have sunshine in Southern Va for the second day in the month. What a pleasure; it’s been gray and gloomy, but I’m not complaining, cause NO snow. It’s been gray a lot here lately. We had a bit of sun today. There’s something refreshing about your vignette, a promise of Spring,perhaps? We had a dusting of snow on Saturday. That was all. I just saw this on Facebook. https://blog.vitalityextracts.com/2018/10/22/i-almost-lost-my-best-friend-forever-heres-the-miracle-that-saved-her/?fbclid=IwAR2HQZpL5rTsvKOVafq6IjSkPUjB-Jk2wvlqSIXmd_aomPsFVY1zGxfbseU It might help your fur babies. Yesterday the mail lady brought me a seed catalog that I sent for, from http://www.botanicalinterests.com I’d like to plant lavender, but I think it may be too difficult from seed. Think I’ll just get the flower mix that is suppose to bring home the butterflies. Last year I only saw one butterfly, so maybe the seed mix will work. I really like your faux plants, and I LOVE the green bottle. Charlie sure is looking cute in the photo today, with that little tongue peeking out, and quiet time for Ivy, bet that doesn’t last too long..(grin) Wishing you a cozy Sunday afternoon…Hugs from below 0 WI. I never can keep lavender alive when I get it as a plant. Much less seed. I think I must over water or have the wrong soil. I love the greenery and always love seeing the babies. Stay warm! The babies have to show off, or I like to show them off! The green cheered me up too. You could add a couple shamrocks in March. I don’t think squirrels bother daffodil bulbs. Something has been digging in one of the pots. I have them off the ground but that won’t make a bit of difference if the squirrels decide to play around and dig. 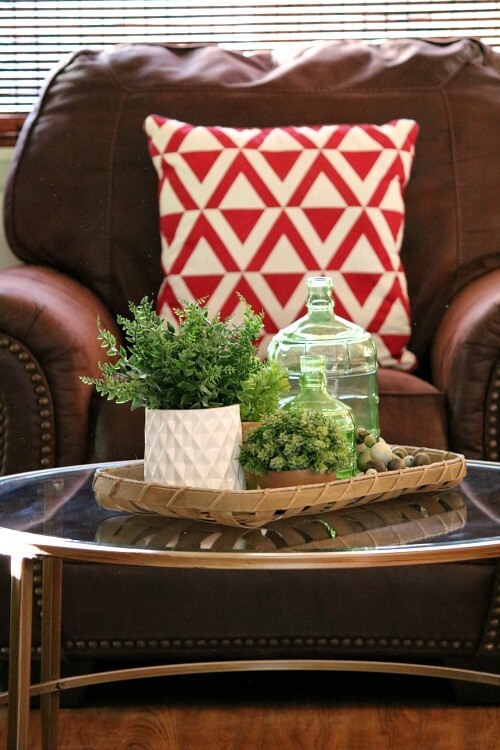 The vignette is great…love the pop of red with your pillows and the great red and white quilts. As always, your tow babies are quite adorable. Winters seem so long sometimes. Stay warm .. (you are ready for Valentines Day, also, with the red and white).. thank you for cheering us up..
I’ve just really been in the mood for red and white lately. 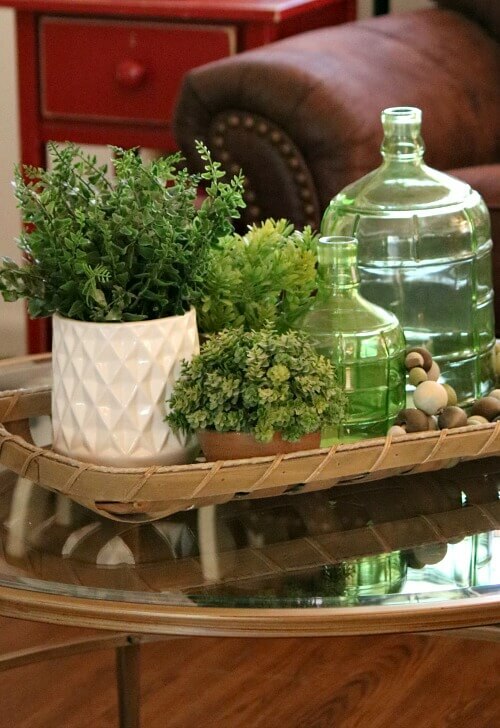 I love the new vignette on your coffee table! It looks so pretty! Love the photos of your babies also…Charlie is so cute with that tongue of his! Love and hugs! I always say he has a reptilian tongue. Love your little green bottle and the green plants. The basket just set them off nicely. I love baskets and use to put assorted baskets on the wall in place of pictures. Have not done that in a while. Charlie is so adorable. His picture today is so cute. Little Miss Ivy looks so sweet sleeping on her quilts. I bet she is dreaming of everything she will get into when she wakes up. Hope you had a peaceful Sunday. No telling what Ivy is dreaming about. She particularly gets into paper and shreds it. I don’t know why she does that. I have to really watch what I put down or it’s mincemeat. Love all of these pretty photos, Brenda! Below zero with a foot of fresh snow here…your greenery is a welcome sight! Below zero? Hope that doesn’t come this way. Cold enough for me as it is. Pretty vignette! Greenery always cheers things up. Oh that Charlie is takes the most adorable photo’s! I am right there with you lets get onto Spring and Summer. Love your vignette. Charlie gets more handsome the older he gets. At least his momma thinks so. Oh my gosh that photo of Charlie melted my heart, what a sweet baby he is!! No spring here, it’s 0 degrees today, which is warm compared to the -8 I woke up to. Brrrrrr!! Some of the looks he gets on his face just crack me up.